Ela getting ready for her first bites! Finally!! The moment is here! 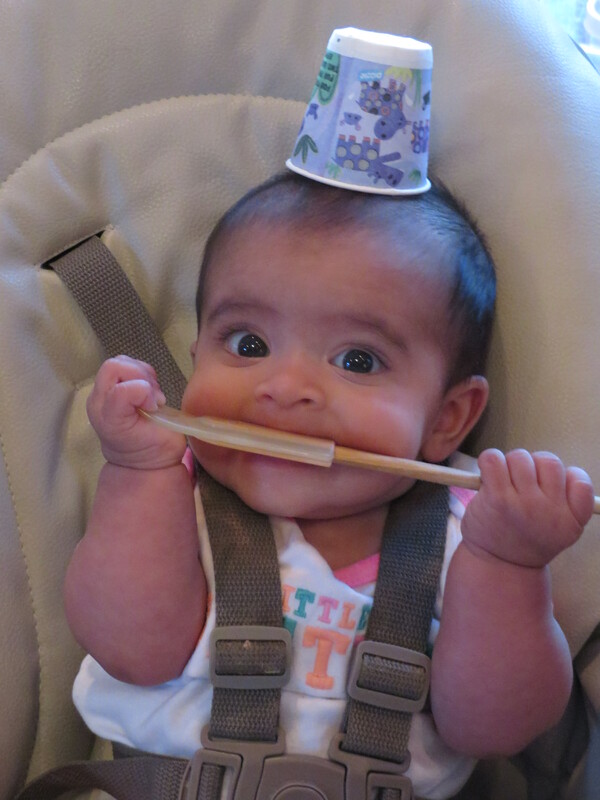 Ela turned six-months-old this past week and we got the official clearance from her pediatrician to start solids. YAY! Oh the pediatrician. Ok, before I mildly rant about anything, I want you to know that I love this office. They are wonderful souls and are always there for us. But the fellow we saw yesterday is a bit old school and gave me the run-down of what I should be feeding Ela for her first bites. Surprise! It was all bland, boring and yucky! As with Kirina, the same box of pasty rice cereal was mentioned. And eating applesauce for five days in a row before trying anything else. 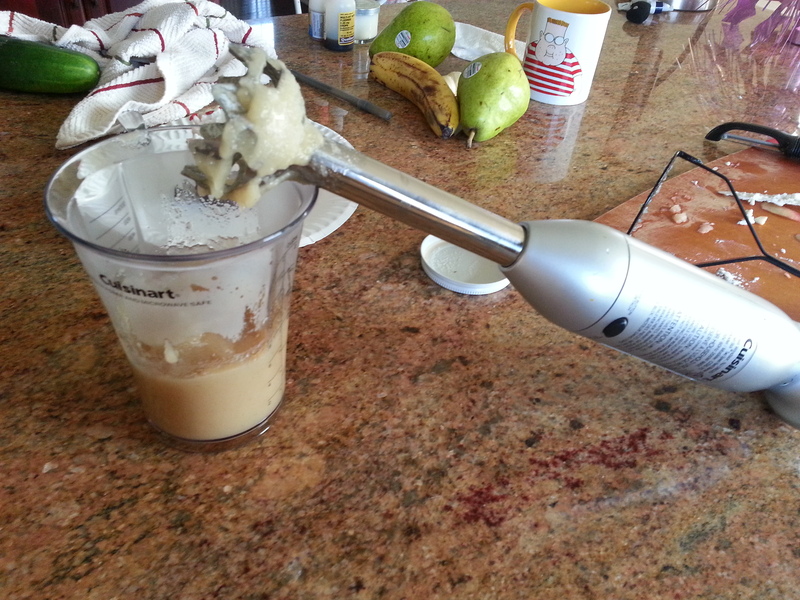 Um, ok, this kind of kills the entire premise of my book, my blog, and my general culinary mission in life. And I thought watching Ela get her vaccinations was painful. The food lecture was kind of soul-sucking! Listen, I get it…safety first. But nowhere in the world do babies eat pasty, dehydrated rice cereal from a box and enjoy it. Babies around the world EAT. They eat WELL. 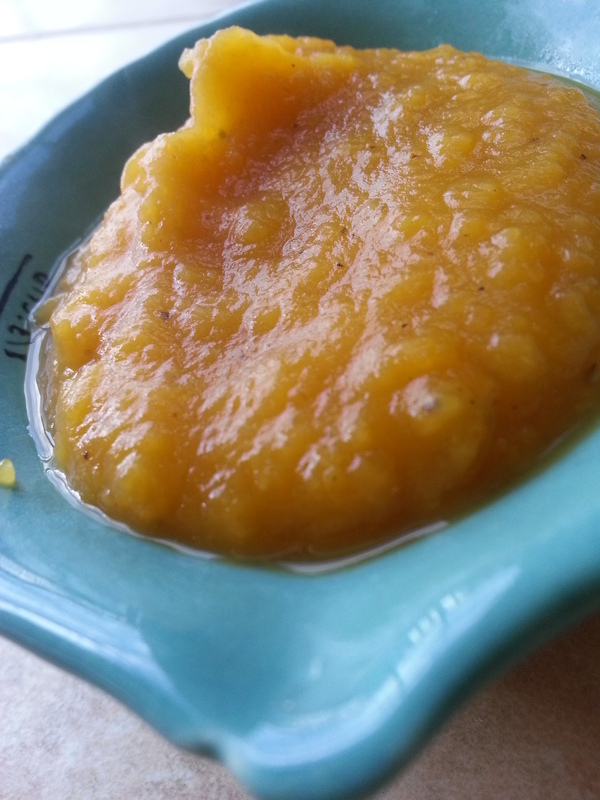 As mentioned many times on my blog and in articles around the pediatric world, baby food doesn’t have to be boring or bland. Babies around the world start eating what their parents are eating from a young age and they are ok. More than ok! They eat sushi! They eat spices and seasonings! And those babies just think it’s normal. They’ve been exposed to so many varied tastes from a young age and they’ve grown up to be diverse eaters because of it. Anyway, enough preaching. I do think safety is a big deal when it comes to babies, and yes, allergies can occur. So when trying any new food (or spice), waiting a few days as the doctor suggests isn’t a bad idea. What is a bad idea is making the same mistakes with Ela as I did with Kirina (yes, sadly, the first child is the guinea pig and the second child gets the benefit of dumbo parents who have wised-up). This means we did NOT start with a box of dried rice cereal for Ela. Ela’s first food? Drum roll please!!! 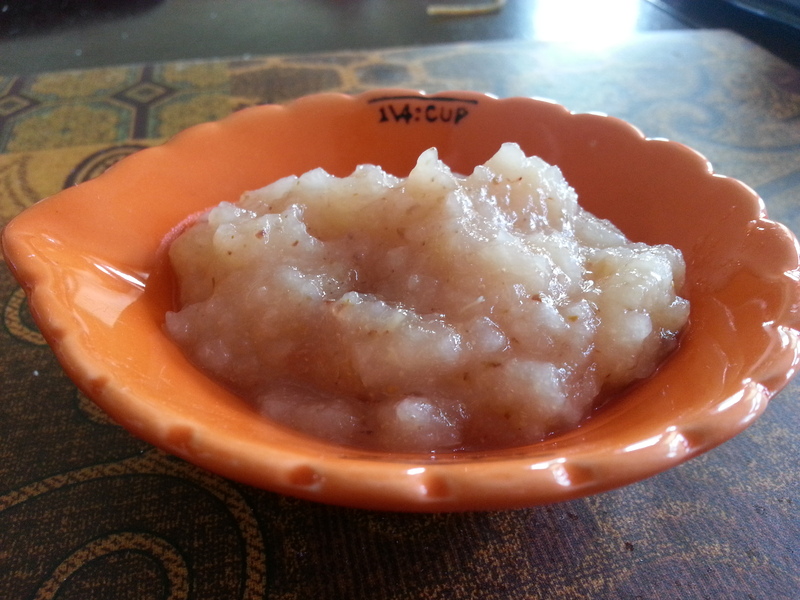 Cinnamon Pear and Fig Puree! Ok, I cheated and gave her two items. Butternut Squash Soup was on the menu too! The full-bodied, adult version. What my husband, myself and Kirina ate for dinner the same night. Can I tell you how addicted I am to butternut squash soup? Farm fresh butternut squash, sautéed with onions, garlic, a pinch of garam masala, salt and pepper. Puree it all together and you have a comforting soup for all members of the family. Ela was sitting in my lap and reached for my spoon. I couldn’t help but give her some. 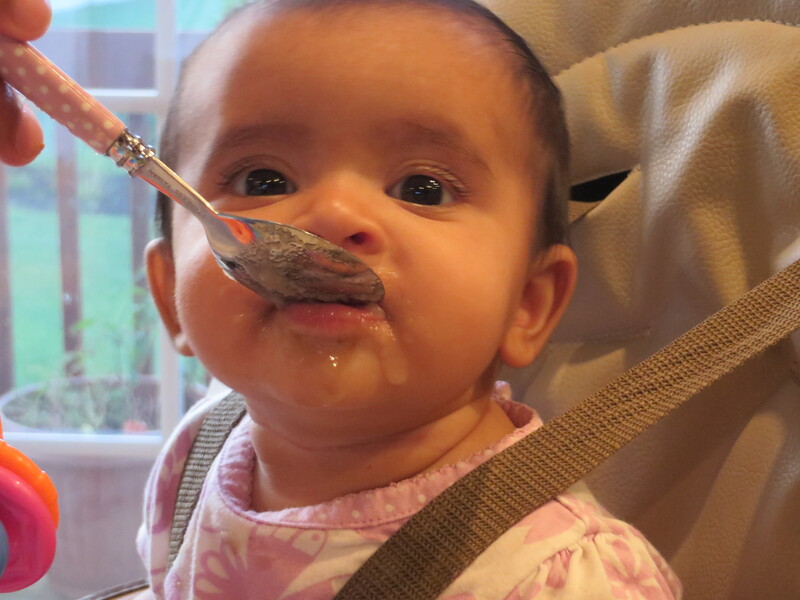 It was certainly a different experience with older sister Kirina (now 3), who was fed bland boxed rice cereal mixed with formula at 4 months of age. It was a pasty mush that she spit out for 4 days in a row until we decided to try some real food and discovered that she just wanted food with more flavor. That whole experience felt like a huge mommy-failure…watching your child reject, again and again, the first foods you are giving her feels terrible. I can’t tell you how excited I am to start feeding Ela all sorts of new foods and flavors! 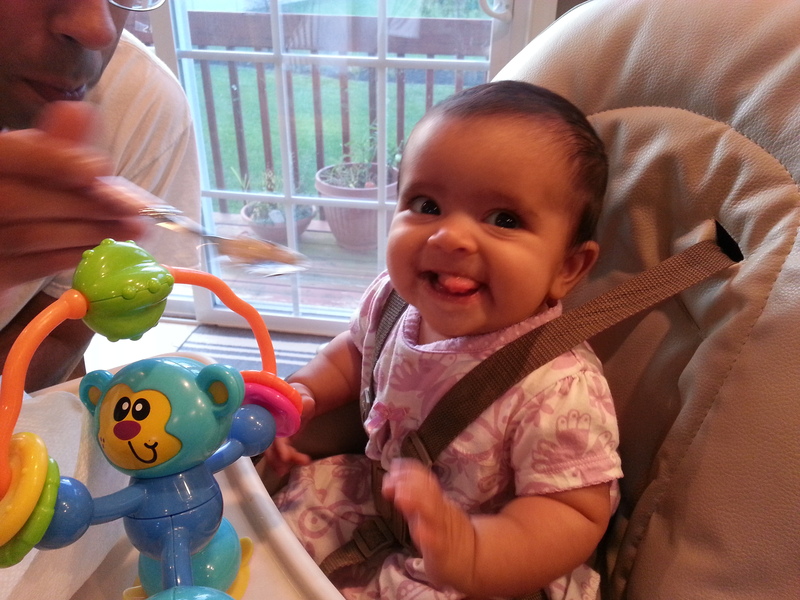 Her little taste buds are going to experience the joys of eating well. Join me on this journey of new foods for new taste buds. I’ll be posting more frequently I hope (as much as they little gummy bears let me). 4-5 (preferably organic) ripe green pears, washed, peeled and sliced. Ripe pears smell sweet and are soft to the touch. 2-3 fresh figs (look in your produce section for these), stem discarded and sliced. 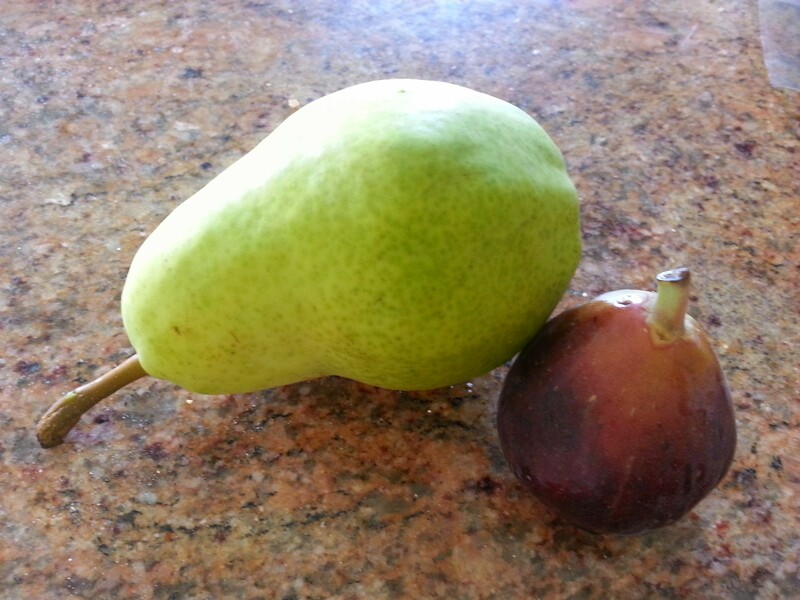 Pear and Fig. Culinary partners in crime. 1. In a small saucepan, add fruit, figs and a few spoons of water. 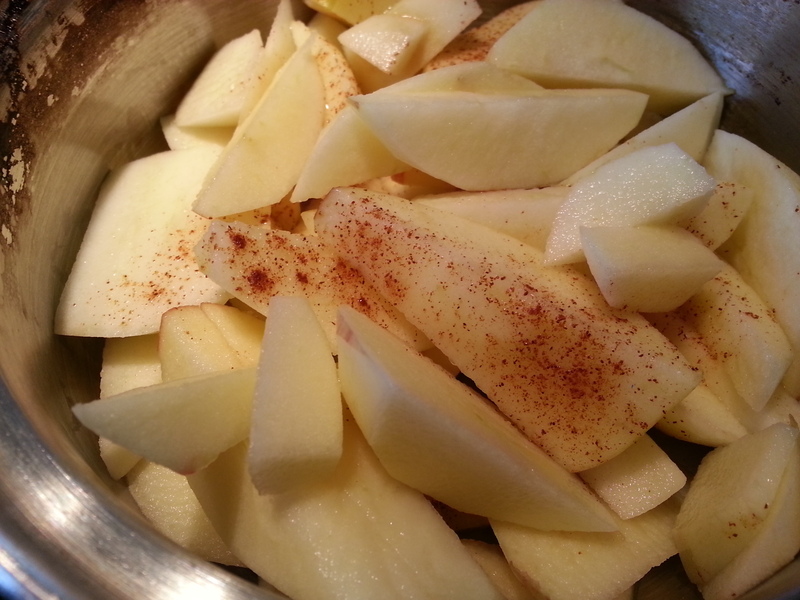 Add a pinch of ground cinnamon. Cover and cook on low to medium heat for 5-7 minutes or until mixture is soft and your house smells wonderful. 3. Serve and enjoy! And make extra because your husband and toddler will suddenly like baby food as well. Munches. As we call her. Reblogged this on Masala Baby Food.